In an earlier post I complained about the practice of some venues to prohibit posting materials on the walls of meeting rooms. 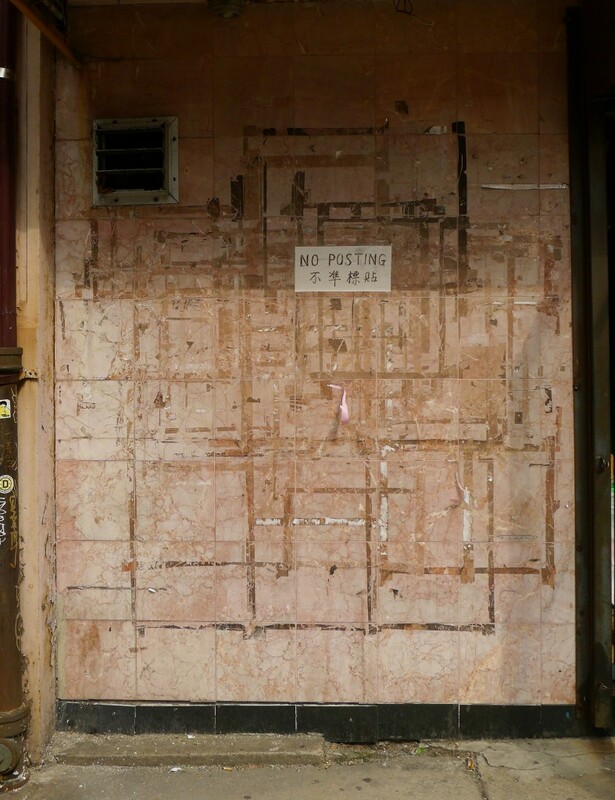 So I thought I’d summarize here some ways to post on walls that avoid wall damage and should be acceptable to any venue. Many of these methods are described in The Big Book of Flip Charts by Robert Lucas, an exhaustive guide to what can be done with those pads of 27″ x 34″ pieces of paper that we know so well. I’ve divided the methods into two groups: attachment solutions and wall treatment solutions. If allowed by the venue, masking tape is a convenient method to hang paper and cards on a wall. I recommend 1″ wide, fresh, name brand (e.g. 3M, Scotch) tape. A couple of 3″ strips of tape placed at the corners will hold a piece of flip chart paper securely. If you are going to be hanging many sheets of paper, you can use a continuous strip of high quality double-sided masking tape e.g. 3M 9415PC. Run the strip horizontally at about a six-foot height, and you’ll be able to hang paper anywhere along its length. Although much more expensive than plain paper pads, flip chart pads with a 2″ strip of tacky adhesive at the top of each sheet provide a convenient method of quickly hanging flip chart paper without having to mess with strips of masking tape. One way to create large drawing surfaces is to tape roll paper to a wall using continuous strips of masking tape. If the drawing surface has to be moved a few times, another product to consider is an adhesive backed paper roll. Two products I have found but not yet used are manufactured by Pacon: GOcraft! and GOwrite! GOcraft! banner paper is available in 12″ x 40′ and 24″ x 25′ rolls. The paper is backed with a post-it like adhesive. The manufacturer claims it will adhere indefinitely to a clean, hard surface and to textured surfaces like fabric covered wall for several days. You use permanent marker to write on the product and Pacon claims that no bleed-through will occur. GOwrite! is available in 18″ x 6′ or 20′ and 24″ x 10′ or 20′ rolls which provide a dry erase surface that can be used with any dry-erase markers, and, according to the manufacturer, erase cleanly without whiteboard shadowing. The product is attached by removing a peel-off removable liner sheet and will adhere indefinitely to most hard surfaces, but will not stay on textured walls for extended periods. Pacon claims that it will not ruin surfaces when removed, and it can be moved “two or three times” before its adhesion deteriorates and the corners start to curl. 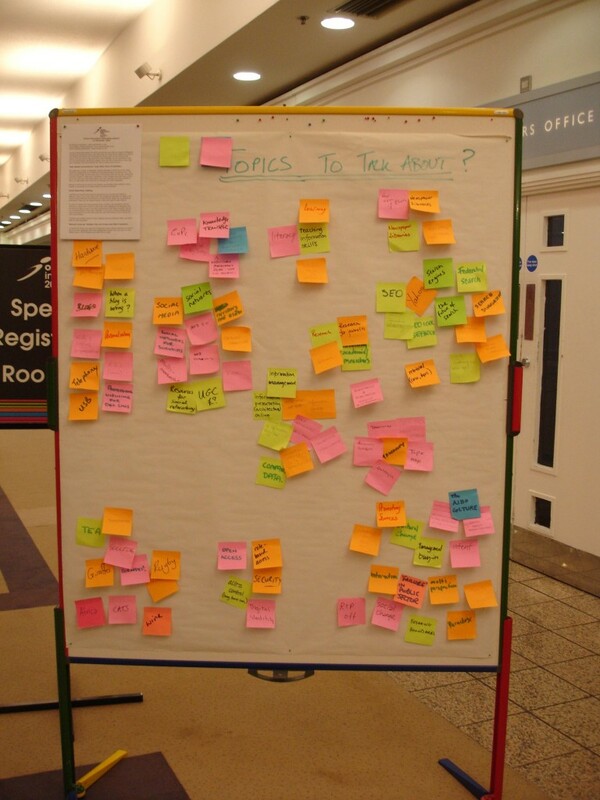 Sticky notes are a great tool for “cards-on-the-wall” group techniques, like affinity grouping, and they are often the only things that venues will allow to be attached to their walls. For small groups, 3″ x 5″ notes may be large enough, but I prefer to use 6″ x 8″ Post-it® Brand Super Sticky Meeting Notes for large groups. Thumb tacks, if allowed by a venue, are a convenient method for attaching paper and cards to cork boards. Buy map style not flat head pins. And at a pinch, straight or safety pins can be used to attach flip chart paper to draperies. For mounting to fabric-covered walls, use these mounting squares, which provide an adhesive side that attaches permanently to paper or card, and a velcro-like side that provides strong yet removable adhesion to fabric-covered walls. Cloth panel wall clips provide another convenient method for attaching paper and card to fabric-covered walls. They are more expensive than adhesive strips, but they can be moved and reused over and over again. Vinyl dry erase pads are 27″ x 34″ white sheets, packaged in a roll, that stick to a wall by static electricity. They will not stay up indefinitely, but work fine for temporary use during an event. Because they stick to everything, they are not easy to install and should be put in place before a session begins. They can be written on with either permanent (preferable) or dry erase markers, but like most inexpensive whiteboard substitutes they are hard to erase completely, so you should be prepared to replace sheets after a few uses. 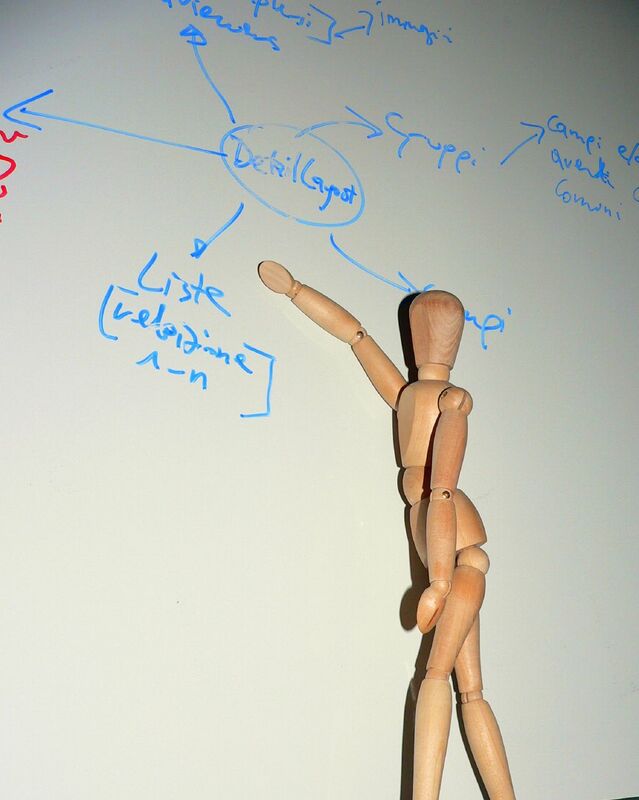 Ideapaint is a treatment that turns any smooth flat wall into a dry erase surface. It has to be applied correctly and is not cheap ($175 – $200 for 50 sq. ft. coverage), though Ideapaint’s price compares favorably to the cost of a high quality whiteboard. Whiteboards offer a permanent solution for writing and posting on venue walls. At prices of around $15-$20 per square foot, they are not inexpensive, but they offer perhaps the ultimate flexibility for meeting activities that require a vertical posting or drawing surface. The older (and less expensive) melamine surfaces suffer from “ghosting” of dry erase markers over time and are not recommended for institutional use. Nowadays, most whiteboards use a hard porcelain finish over steel, which allows the use of magnets to hold materials on the surface. There are probably other methods available for non-destructive posting on walls that I haven’t mentioned here. What have I missed? Recently I’ve been frustrated and baffled. No less than three venues (two hotels and a conference center) in the last month have informed me that I was not allowed to post anything on the walls of the room I was meeting in. Nothing could be posted. No flip chart paper, no masking tape, no stick pins, no thumbtacks, no sticky notes, and no wall clips. To add insult to injury, none of the venues apologized or offered any suggestions on alternative ways I could display materials on a vertical surface. None of them had any substitute surfaces, like large portable notice boards or whiteboards available. On walls, notes or cards can be placed anywhere in a seven foot band between the floor and where people can reach, while on tables, human reach limits us to a three foot band. Information placed on a wall can be easily seen by many more people than if it is displayed on a table. Some of the most powerful techniques available for group problem-solving require ways to display multiple pieces of information to an entire group, whose members can then easily and publicly move items around to cluster, list, sort, and map relationships. Schools have used blackboards (aka chalkboards) for two hundred years to display information to students, thumbtacks (aka drawing pins) have been around for over one hundred years, masking tape was invented in 1925, and we’ve been using post-it notes for over thirty years. These are not new technologies, folks, why are they now being banned from the walls of venues where we meet? I understand that venues are used for many different purposes, and wall damage, through incorrect use of attachment technology or marker bleed-through, costs money to repair. But “wall work” is an essential component of group problem solving, and for a venue to prohibit its use while offering no alternatives mean that many kinds of useful meetings will not be held there. In the second part of this post I’ll cover some of the technologies now available for posting information on walls, including some that you may not know about. Stay tuned! Have you had venues not allow you to post materials on their walls? What did you do?